At FEICA we’re always looking for ways to make the Adhesive & Sealant Conference and EXPO even more useful and productive. As the Conference grows, we know that it can be a challenge to get to meet up with everyone you’d like to see and keep track of all the Conference sessions you’d like to attend. 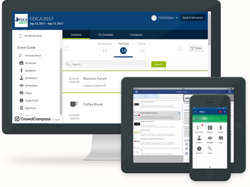 In 2015 we introduced a new tool to help you get more out of the Conference – the FEICA App. With so much to see and do during the event, the app will make sure you get the most out of your visit by planning in advance and having your personalised event information in your pocket when you’re there. As soon as we’ve received your payment for the Conference, you will receive access to the app so that you can start networking and planning for the event. Edit your profile and add information to be viewed by other attendees. Plan your visit - build your personal agenda. Network with other attendees, not only during, but also before and after the event. Browse exhibitors and mark the ones you’d like to visit. Find your way around with a map of the venue and EXPO. Only registered participants may use the Conference App. You will receive access to the app after payment of the registration fee. Holders of a Wednesday Expo Pass do not receive a login for the FEICA App. Although you can network and arrange meetings through the app, your email address is not visible to other participants. Search the App Store for "FEICA Links" or click here to download now (if viewing this page on your iPhone or iPad). Search the Google Play Store for "FEICA Links" or click here to download now (if viewing this page on your Android device). Simply visit https://crowd.cc/feica2018 on your mobile phone. *The mobile website can be accessed on virtually all mobiles phones. Some features may be limited due to device browser limitations. Using the Visitor Portal on a computer: click on your name in the top right corner of the page and select Edit Profile. Using the Android or iOS app: when you are logged in, click the menu button in the top left corner of the screen and click the arrow next to your name. Select "Edit Profile" or "Edit Profile Photo". Fill in the information you want to be visible to other visitors. We recommend using the Visitor Portal for this. View the conference schedule, view sessions details, and add sessions or presentations you plan to attend to your schedule ( ). This will create your own personal Schedule (available to you in the My Items menu). View exhibitors’ profiles and bookmark the exhibitors you plan to visit ( ). Bookmark and/or add notes to attendees, exhibitors, sessions and speakers. These will be saved in the My Items menu. You may also easily send all your notes at any time to your e-mail. Choose the Network icon ( ) to view the attendees who are available for networking. Find the person you want to arrange a meeting with in the network listing, view his or her profile and click the “Meeting” button ( ). The app adds the meeting to your personal Schedules as tentative and sends your request to the selected attendee, who can confirm, decline or suggest another time. If he or she confirms, you will receive a message and the app changes the status of the meeting in your personal Schedules. The meetings can be easily rearranged at any time. Use the messaging service to send messages to other attendees. Tap on the Network icon. Find the person you would like to message and tap on his/her name. In his/her profile, tap the message icon ( ). Write your message, then tap Send. To check if you have any messages, look for My Messages in the side menu. If you have a message, there will be a red circle with the number in it. Tap My Messages to see who's contacted you. We hope you find the FEICA App useful and look forward to any feedback you may have about it.